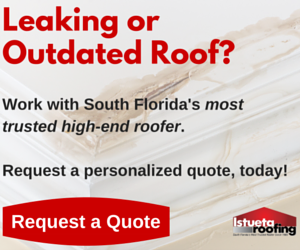 When Istueta Roofing uses Santafé Tiles, we work with you to create a customized blend that will be truly unique to the roof on your house here in Miami. With Santafé Tile Roofing, there are quite a few colors to choose from. You decide which colors you want and the percentage of each that you want represented. Once the tiles arrive in Miami, they’re immediately and solidly set into place as your new roof. Every tile is individually placed during installment to provide that great, unique look. Our special touch ensures that there won’t be a specific pattern, nor will plots of a single color stand out anywhere, either..
With this strategy, even if you pick the same colors as someone else, you won’t get the same exact look. If you want to see a great example, check out this youtube video. This beautiful house needed an equally beautiful roof and I think we delivered! If you are interested in a custom blend of Santafé Tiles for your roof, give us a call. We will help you choose colors to match the look of your home and we’ll install it with the highest attention to detail.